So many times I have tried to find the words to explain the city of Lagos to someone and so many times words fail me. This is not a city you can try to describe, but it definitely a city you have to visit. I can best describe my relationship with Lagos as one of a person in an abusive relationship. I arrived in Lagos after 4 months of the toughest travels across West Africa, within a week I was bedridden with Malaria and I was out of action for 2 weeks popping horse tranquilizer sized pills and capsules (My doctors were amazing but I will never forgive them for expecting me to swallow those vile things). 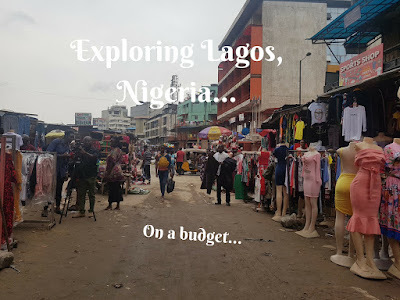 Lagos found me at a stage of my travels were I was broken and just ready to break down and cry. Lagos is a busy city, with over 8 million citizens it is the financial hub of Nigeria. Lagos is a tough place to navigate, but the hospitality is out of this world. The locals are so loving and friendly, they are so generous and they will help you find the easiest way to get through the city. Since I know you must all find the time and visit this amazing city, I have given you some of the best things to do in the city. The conservation centre was established in 1990 by the Nigerian Conservation foundation to protect the wildlife and mangrove forests from the threat of urban development. The Lekki conservation centre is on the Lekki Lagoon, and near the Lagos Lagoon. It protects the wetlands of the Lekki peninsula which consists of swamp and savannah habitats. The reserve is home to monkeys, crocodiles, birds and snakes. 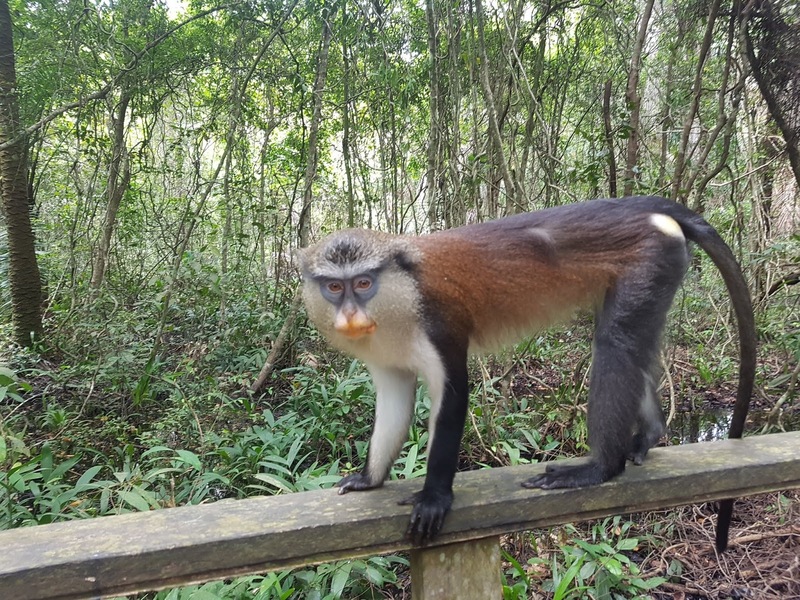 At the reception area which is an outdoor thatched roof structure, you will be welcomed by the monkeys that call the conservation centre their home. These are wild animals so please don’t try to feed them or pet them. You will be assigned a tour guide who will talk you through the walkways in the forest. Lekki is home to Africas longest Canopy walk. 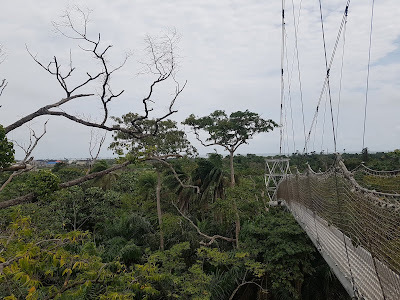 On this canopy walk to get elevated above the forests and are able to view some of the wild animals from above. Advised you do not carry any loose items because if they fall, you will not be going to swim in those mangroves to dig them out. The centre also has an open part with jungle gyms for kids and a large chess board where you can come and set up your own picnic. There is a lady with a tuckshop with snacks but variety is limited so if you are a picky eater, advised you bring your own meals and snacks. 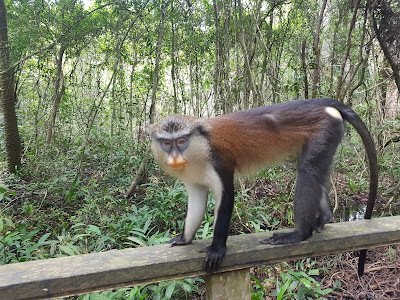 Africas longest canopyar Lekki conservation centre. Cost: N3000/USD 8.5 - for the conservation centre and the canopy walk. 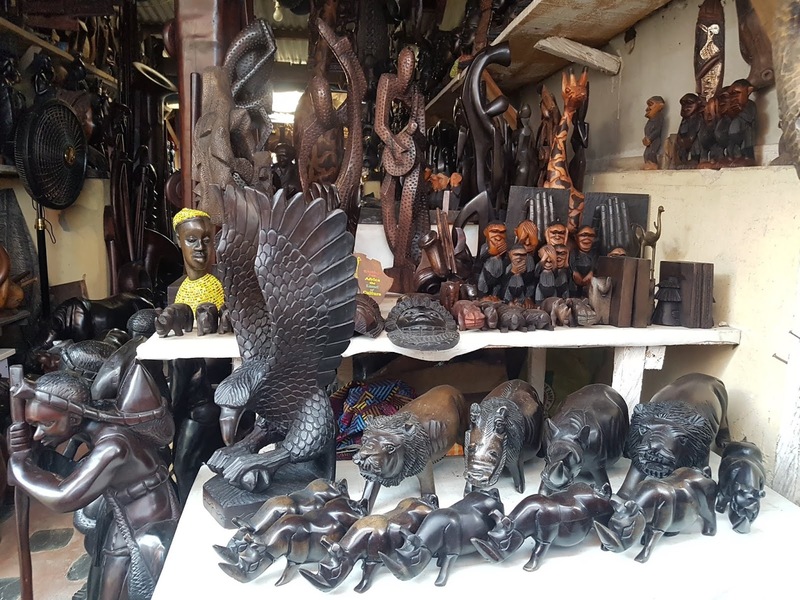 The easiest market to navigate in Lagos will be the Lekki Arts and crafts market. Here you can walk up and down the various isles browsing for the perfect souvenir. From Ankara material, clothes and accessories. The local craftsman will be creating their magnificent works of art. You are allowed to take pictures but please ask for permission first, especially if someone will be in the picture. Balogun Market is the largest market in the city of Lagos. this marketplace needs patience. traffic is caused by the yellow busses, the kekes, okadas, people and the market stalls. this here is a nightmare to navigate, most locals avoid it too. Best time to visit Balogun is on Sunday morning when everyone is at church. the market is still busy, but there is no traffic. I have never imagined myself as an art person or fascinated by art galleries. That is until I met Aunty Nike (pronounced Nee-ke – don’t worry, I also at first pronounced it like the sports clothing brand). The art gallery is owned and my managed by the most respected , internationally known Nigerian female artist and has made astounding strides in textile, visual arts, mixed media painting. Some of Aunty Nikes work can be found in the White house and museums around the world. A self taught artist who has been making art since the age of 6. The art gallery is made up of 3 stories and it boasts various art from over 80 different local and international artists. Here you can also buy some souvenirs. Outside the art gallery is a coffe shop where you can rest and enjoy refreshments. 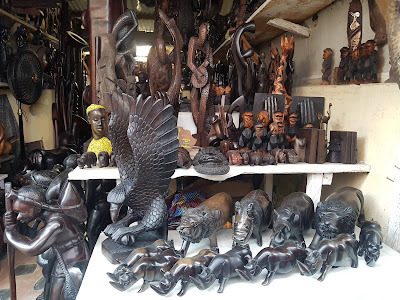 Cost: Your budget for art and souvenirs. How about a boat ride on the Lagos lagoon. What better way to get on the boat ride and make your wat to Tarkwa Bay for some beach bumming and surfing with locals. Tarkwa Bay is very popular weekend destination for locals for good reason. The boat station has a tuckshop where you can purchase refreshments but since you will be out all day you are encouraged to pack your own lunch. The weirdest thing about Nigerian beaches is, you have to pay someone for use of the beach. The “owner” of that part of the beach will communicate with you regarding the cost. Haggle your way through it. There is no receipt or anything official for your payment. An entrepreneur saw an opportunity and enterprised. Join the local Yogis for a day of yoga on the beach. Now, this is really fun. Miche’al Ernest and Sandra are local Yogis who run Breathe Yoga studio in Lekki Phase 1, Lagos. Once a month, they plan an outdoor Yoga experience where you get to also meet and socialize with local and visiting yogis. Check out Breathe Yoga Studio for more information. I am tempted to say ride the local public transport. Starting with the famous signature Lagos yellow bus but this is challenging and overwhelming. I did it once and I was not ready for that challenge. I found the bus stop names very confusing as I was not well acquainted with the local languages. But the locals will easily help you get to where you are going, the local busses do get overloaded so there will be plenty of shoving there – but DO IT!!! (I’m laughing as I type this cos that experience is priceless. The keke is the small yellow mode of transport that depending on where you are from may have a different name. In South Africa we call them tuk-tuks. Ride one as it navigates its way through Lagos traffic and try to squeeze between cars or even get off the road to beat the traffic. The Okada is the local motorbike taxis. Locals do not advise you ride these as these guys drive like they have no sense but I found explaining to the driver that you need him to drive safely worked magic. Just make sure that you get off or on the left side of the bike so your calf doesn’t meet with the boiling hot exhaust. That pain is madness. Although I appreciate my scar and have fallen in love with it. These are the most affordable modes of transport although you have other options. 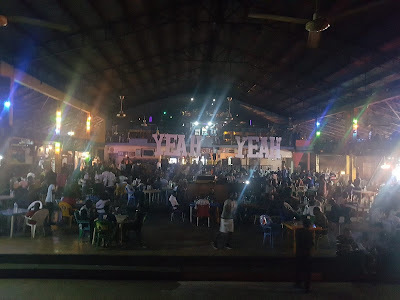 This has to be the largest party spot in Lagos. Here you can do a tour (best during the day to learn more about the journey of legendary musician Fela Kuti and his journey through music and influence in Nigeria and the world. The venue and all events are about empowering the community and access to entertainment that will be affordable. Come prepared for some palm wine and suya. Everyone here smokes weed, prepare your lungs if you are not a smoker. The whole place is a buzz and there is sufficient security when it’s not major events. Side note: Avoid at all cost during major events for safety and security purposes. Ok, this may be quite tricky if you don’t have Katchies level of madness and confidence. An Owambe is a Nigerian wedding, and everyone knows no one celebrates weddings like Nigerians. From the bottomless jollof rice, money spraying, and fine liquor that flows from what seems like the fountain of youth. This is a huge party. Ask around on social media and there will always be someone going to an Owambe, although there is an Owambe season which starts around September going to December. Bring your dancing shoes. Read more more on what you need to know before visiting Nigeria here.